want to neglect the DOOTDOOTGARDEN blog any more than I already do. The garden needs weeding, watering, and few more flowers planted. a.) A collaboration with poet Kazim Ali for the CBLDF‘s Liberty Annual. b.) 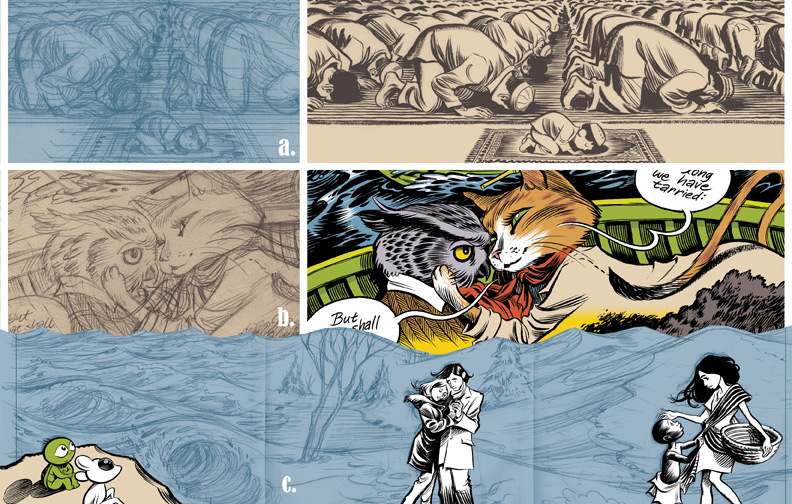 Edward Lear’s “The Owl and the Pussycat” in comics form for the upcoming NURSERY RHYME COMICS from First Second Books (October 2011). Thanks to all of you for your patience. The HABIBI tour will be here sooner than later. And an update for fans in the Philippines: It looks like I’ll make it to Manilla early next year. See you all soon! Wow, you seem very busy with those projects! You should have your own Facebook page Craig! I agree with David D about your own Facebook page. But we’ll always have this blog, which is much personal! Your ‘owl and the pussycat’ tidbit looks so lovely. Nursery rhyme comics are such a great idea! Looking forward to checking out the 49 other stories too. Whoa! For reals?! Manila early next year?!? We can’t wait!!! I’m loving the artwork for the poem===beautiful as always! I’m excited beyond words for Habibi. Hey Craig, a big fan of your work…. i am from India and i am writing a comic book… any chance of you visiting India…. waiting for Habibi… all the best. wow! MANILA! I LIVE in MANILA! Yey! “how come we have to live here anyway hum?” – first thought that comes to mind! I wish I could be there. Will have to get my hands on that tri-fold poster somehow. Looks beautiful. Oh!! I have to miss ComicCon due to the library branch I work at in Vancouver is opening that week, so no trip for me. Craig: you are an awesome and inspiring artist! I too will add my “Thank you from the bottom of my heart for Blankets” to the large pile. I loved it. I’m so excited! I LIVE IN MANILA. I hope I get to see you. Your work has truly impacted my life. I know that’s kind of corny, and sounds a little hyperbolic, but it’s true! wonderfull, all the lines and colors !!! a big hugh from Brazil! I just read Blankets! I know….I am behind the times. I had to write you and tell you that I think you are a tremendously honest artist. The text and illustrations intersected beautifully. At one point in the story when you wrote and drew about you and your brother, I was literally gasping and weeping with emotion. You have so much courage, sensitivity, and integrity and I thank you for it! Your novel will stay with me forever. Is there any possibility to get this poster outisde the San Diego Comic Con? Hi Craig! Thank you for posting about your collaborations… I’ve always loved discovering new creatives and Kazim Ali is no exception. Plus points since he shares a name with my brother But I love the snippets you post up… I’m mostly a lurker, but I guess I just wanted to say thank you, thank you for posting your work, thank you for being amazing. Wish you could come to Australia some time soon! Hi! Can you please say more about the collaboration project with Kazim Ali? I’m a big fan of his work (and your work)! Also, I work for the Young Muslim American Voices project at Center for American Progress and plan on featuring him in an upcoming post on poets and writers–any more info would be great!! Thanks! is there any chance of ordering this or any other (screenprinted) poster of your work? I’m really looking forward to Habibi! Keep up the good work! Come to Singapore!! You’ll want to write/draw a new book after that. I’d never read a graphic novel until I picked up Habibi last week. It looked like traditional Islamic text. I flicked through a few pages, recognised a view verses and realised I felt a jolt, curiosity and anxiety. I needn’t have worried. It is beautifully inked, respectfully composed, and quite a pleasure to behold.I purchased and read Blankets today. Sweet novel. Hi Craig. I was given a copy of Blankets years ago as a birthday gift.. and just finally got around to reading it today. I’m still trying to digest it all.. but.. I’m floored. The similarities… I don’t even know what to say. I look forward to reading Blankets again and again.. and will be visiting the book store tomorrow to pick up the rest of your work.